I love cocktails – summery, bright, yummy cocktails. Don’t you? Miyagawacho Gacha fair, summery drinks seemed appropriate. Especially since the theme is summer. The -Hanaya- Summer Cocktails gatcha set consist of 9 cute cocktails, which attach to your avatar and include a drink animation. 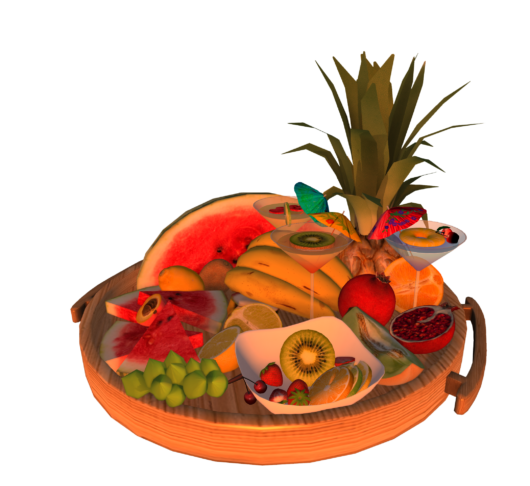 The rare is a sumptious wood tray drinks dispenser loaded with fruit. When you wear the tray, your friends can click to get random drinks. The tray can also be rezzed out for use. Both the tray and all the cocktails are mesh. This entry was posted in Events, Product Announcements on August 1, 2015 by moriko.